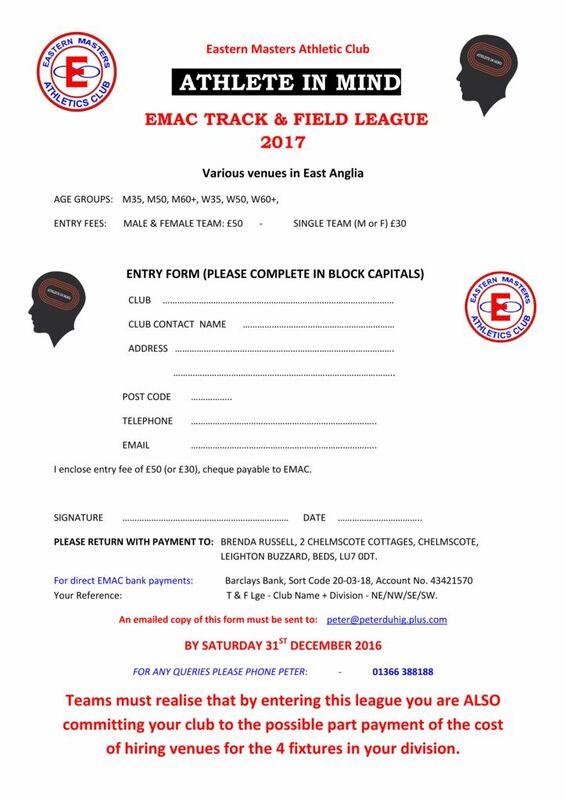 I am pleased to announce we have a new sponsor for the T&F League 2017 and would like to thank ‘Athlete in Mind’ for their generosity. Please support them throughout the year, they may want to pitch up at your League fixture, so please do your best to accommodate them if you can. They are not only paying for the League Numbers, the Medals for the Final, but also for Man & Woman of the Match Trophies at each of the 16 fixtures. An added bonus that our sponsor is an athlete himself and will be competing in the league. Last, but not least by any means. We still need someone to take over my duties. I will not be around for much longer ! 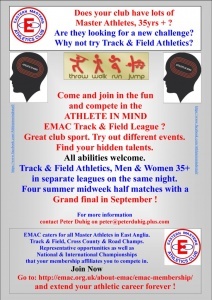 The league is the most active part of EMAC. We have Divisional Secretaries to help, we just need someone to fill my shoes and manage the other bits and pieces, Permits etc, and making decisions if there are casting votes required. Everything else is handled democratically via the Div. Sec’s liaising with you the clubs and deciding what is best for each division and the league. PLEASE, PLEASE, PLEASE, Don’t leave it to someone else. If you can spare a little time contact me NOW. Thank you. I look forward to seeing (from afar) a strong league competing again this next year. 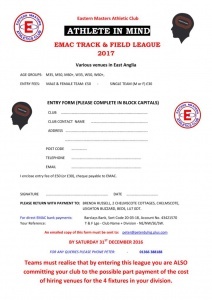 Tagged 2016, 2017, Fixtures, Track & Field.